After a few days bicycling all around the city -- and getting lost each time -- I decided to do a practice run out the road I'd be heading out on. Nine-thirty one morning I packed the guidebook and camera in one of the panniers, threw in the tire repair kit, and headed to the northeast of town. Although the streets were marked in Vietnam's western-style alphabet, the traffic was so busy that I couldn't slow down to check signs. Eventually realizing that I had missed my turn, I backtracked, cut across the oncoming hordes of cyclists, and started leaving the city behind. Vehicles -- large trucks and busses -- became more apparent now, and the speed of traffic increased. The horns continued to blare -- if a vehicle had a horn, it used it. It sounded like every vehicle had its car alarm going off. I was learning what I needed to know, however. Road surface was OK, vendors were selling sodas and bottled water every kilometer, and periodic road markers indicated the distance to major cities. I stopped to eat when I was about 55 clicks out -- this was my final hurdle. Saigon was easy, but I would need to get used to eating at roadside stalls. Lonely Planet advised me that I should be looking for signs that said "Com Pho", if I wanted one of the common rice and soup stalls. I selected a place and pulled over the bike. Kids came over and stared. The woman was friendly, and waved me to one of the small plastic chairs. I pointed to the sign, said "fo" and nodded. She nodded in agreement, and said something. It ended like a question, and I sensed that the ball was back in my court. Her chalkboard sign had other words on it, and my experience in Saigon with the ubiquitous Top-Ramen-like soup was that I needed to identify the meat. Next to "PHO", her sign said "BO" and "GA". Flipping quickly through Lonely Planet, I saw that chicken was "thit ga". "Ga", I stated with a certain authority, and the woman nodded approvingly and stepped away. Five minutes later I was rewarded with a plate of mixed greens, and a large bowl of noodles with chicken pieces. Remembering the warnings about uncooked food, I reluctantly passed on the uncooked greens, and dug right into the pho. The food was good. After paying I lingered in the shade, enjoying the respite from the midday sun. 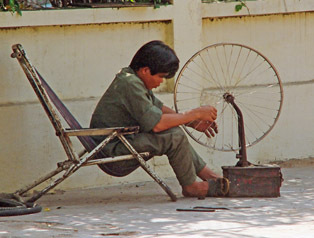 Glancing up I saw a bright bicycle speed by, back toward Saigon. It was the helmet that probably drew my attention first, and I figured that the bicyclist had to be a westerner. Earlier in the day I thought I had seen another westerner rip past me towards Saigon, so I hopped on my bike, and gave chase. A few minutes later I caught up with the bike. The rider was Doug, a physician from New York. He was part of the Cycle Vietnam organized tour, and today was their last day -- they had made it from Hanoi to Saigon! Actually Doug was a little more specific. Apparently three of his group of 27 had bicycled the distance. The others had used the bus for different portions of the ride. Doug figured the rest of the group was probably on the bus right now. Apparently they were meeting at a roadside stand just this side of the big bridge over the Saigon River for a group picture riding into Saigon. Doug was not the best salesperson for this trip. The distances had been long, they hadn't had the chance to slow down and meet the locals, and almost everyone in the group had had rocks thrown at them repeatedly. "Rocks thrown at you repeatedly?" I echoed, my heart picking up. "Yeah, a lot up north, but even as far down as Dalat." I did not take this as good news. Just when I was thinking I could do it, this curve ball is tossed. I grilled him for details -- I wasn't too keen on biking through a foreign country as a moving target! Bit by bit, details came out. It turns out that the rocks were small, and generally thrown by kids, and that the throws were generally not that hard. On the other hand, a few of the riders were also hit by sticks, and one person had his bike stolen off the bus, while it was moving! I was not pleased with what I was hearing. An hour or so later we arrived at the roadside cafe. Sure enough, his whole group was there. I guess they did take the bus. They started in Bao Loc this morning though, and after glancing at my map, I'm not about to judge them -- Bao Loc to Saigon is 180 kilometers. Even without baggage, a bus sounds pretty tempting with that kind of distance. I chat with the group, and find them quite likable. Apparently everyone did have rocks thrown at them, and a bike was removed from the moving bus (returned for a $20 finder's fee). Two of the guys tell me about a side trip some of them took, breaking off the group for a few days, and heading inland. I guess a bike broke down, or someone became ill, but someone needed to get back to the main group. The solution: He just rented an entire bus outright. I don't remember what he paid, but the tale gave me comfort. With a westerner's wealth, I could come up with solutions if things screwed up. A bicycle pulled up to the cafe and the crowd cheered. It was the last of the group -- the third individual who had ridden the entire way. He was 62 years old, Doug told me. As the group got ready for their photo op ride into Saigon, I said good-bye and pedalled back into town. A few more days passed, and I knew it was time to get going. I had picked up a nice burn on that 110-k day trip, and it took visits to a number of shops in Saigon before I found sunscreen. I had come to Vietnam with a little two-ounce tube. I now bought two more containers of sunscreen -- family size! I developed the first rolls of film I had shot, and stashed the prints and negatives in the bike box I would be leaving behind. I also stashed the extra city clothes I had brought along. Tomorrow was the day. 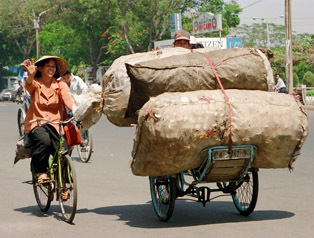 I packed my panniers, attempting to distribute weight and mass evenly between the four. I taped little scraps of paper to the top of each, reminding me of what was in each. I fell asleep late. The alarm went off at 5:15 a.m., and at 6:10 I was on the road, heading north. 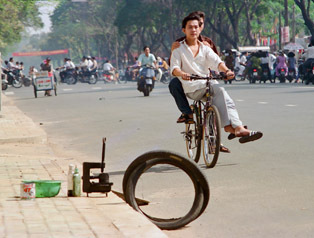 Vietnamese put their bike tires to the test every day!